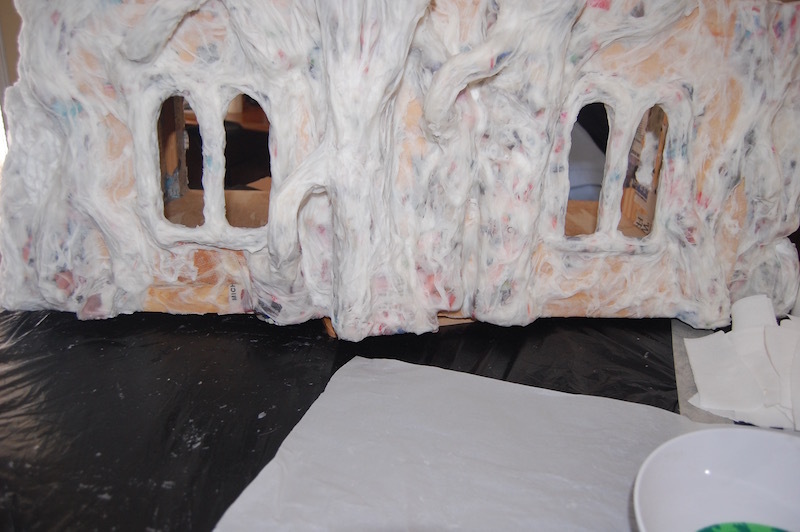 I have been having a blast doing paper mache on my dollhouses. Probably the best thing about doing paper mache is that once you start, you cannot stop to answer the phone, cook meals or even do chores! You are literally up to your elbows in glue. 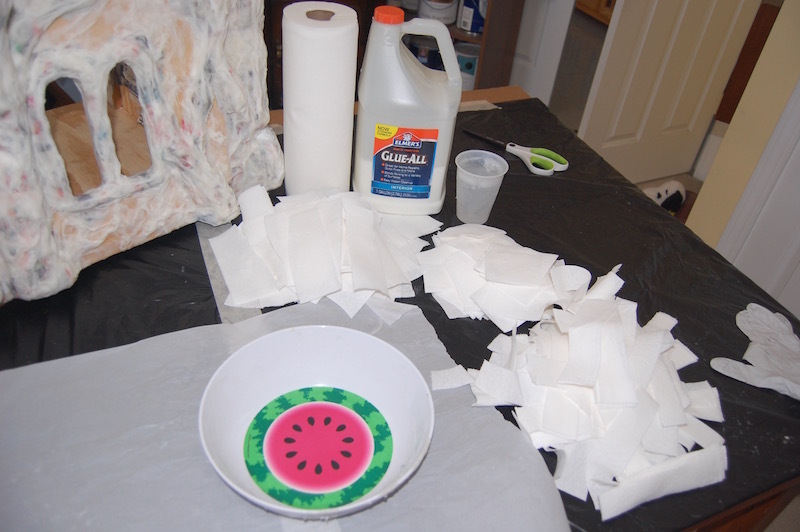 Here are my secret ingredients (well, not so secret) for adding texture to Hazel's house - white glue, water and paper towels. Wow Sam! The detail you have achieved using such simple ingredients is amazing! This is going to be such a special build - I am so excited to see it progress. Hopefully, you can enlist help with the chores while you are elbow deep in the artistry! Thanks Jodi. Oh yes, my kids are fantastic - they do lots of stuff willingly and without question. I went back to read the beginnings of your paper mache on this house and this is impressive work! I have done this with paper towels and glue on a coffee can to make a tree stump house for my realpuki, but this is a massive project! May I ask are you altering the house to make it look like tree branches growing over it? or look like a large tree house? That will look so cool! houses done like this are always so creative, I love watching what you do. Thanks Lisa. To tell you the truth, I have absolutely no idea! I just liked the idea of tree like structure and it has taken on a life of its own. 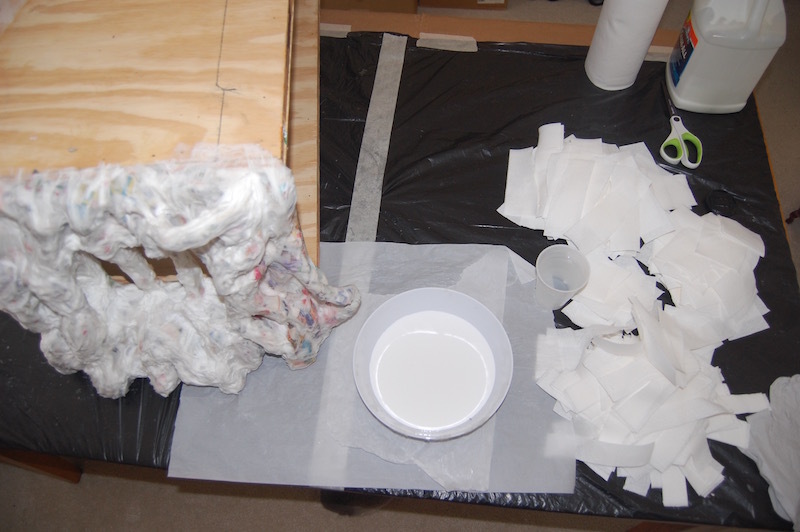 (Actually I am doing paper mache on three houses at the same time.) I am curious to see if it will turn out, or just be a big mess! Oh wow that is great stuff for adding texture! I would love to have a go at that but what could I apply it too.....starts thinking!! Looking at the bits of the house we can see here in the photos, it almost reminds me of some of the Gaudi architecture in Barcelona! Thanks Sharon. Giac said the same thing. I googled Gaudi architecture and it is so interesting! My daughter wants us to visit Spain now to see it in person! I have used this technique on things in the past, but I get more than a bit stressed out by all that stickiness on my fingers, so I'll leave it up to you now. :) That second photo looks kinda eerie and ghost like. I do like seeing your progress photos, so keep them coming. It is looking terrific, even unpainted it is beautiful. 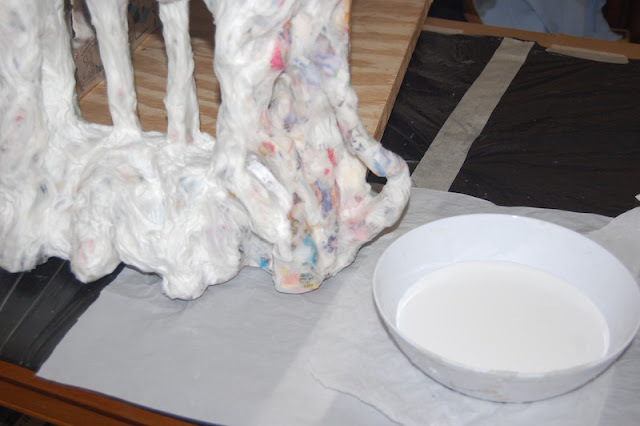 I never work with papier maché...way too messy for me...but it is a medium I admire very much. N.B. I agree with your daughter, you should go to Spain! It is beautiful and Barcelona is my favorite city in the world. Thanks Giac. Yes, Spain is now on our bucket list! I hope you managed to get your fingers clean again in the meantime... ;O) But the result looks stunning so it was worth to have your elbows deep in this glue mix. I can hardly wait to see more.